A Random Pattern » Walk before you crawl? « Pulled post on the Palm Pre? These are things we tell our kids. But I bet your first reaction on reading those words was negative. Did they excite you, or did you brace yourself, grit your teeth subconsciously? I have a 9-month old. He figured out crawling a little while ago, but last week he learned something new. He learned he could stand up on this little rocking chair we have. For the last several days, Elijah has spent most of his time at this chair. It’s really quite adorable. 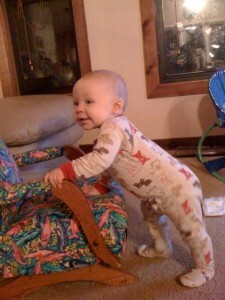 He crawls over to it, pushes, pulls, and works until he gets to a standing position holding on to the chair. Then he stands there until he falls over. Lately he has begun moving his feet. For some reason he really wants to climb on the chair, but he doesn’t have the skill. Still, he’s learning the skills he will need to walk, even if he doesn’t realize it. For those of you who’ve been around young children, I don’t have to tell you how adorable this is. Inspiring too – he doesn’t know how easy or hard this whole thing should be, that he should give up, or that he’s working towards something he’ll need for a life skill. But he does know how to be persistent in working toward something he wants. Maybe we forget this later on, maybe we get distracted by too many goals, shiny things, activities. But there is no substitute for “crawl before you walk”. I unreasonably expect to stand up, and even start running, when I haven’t been practicing or training. I expect success and perfection when I haven’t worked through the failures. I enjoy and admire watching my children work hard to – slowly – gain new skills. Maybe I need to learn to enjoy and admire walking through that process myself. Should we be quicker to learn as adults rather than children? Or do we expect to many shortcuts and quick fixes? This entry was posted on Tuesday, September 29th, 2009 at 10:48 pm	and is filed under personal, philosophy. You can follow any responses to this entry through the RSS 2.0 feed. You can leave a response, or trackback from your own site.